2018 Update: The ACAM Student Journal is now open for submissions for its second publication! The journal this year will be posted online rather than as a paper publication. All genres of work are welcomed (including multi-genre or cross-genre works). Examples may include, but are not limited to: academic essays, creative writing, visual artwork, community work, films, and music. You do not have to identify as Asian/Asian Canadian in order to submit; submissions from all voices are welcome, as long as they adhere to the theme of the journal. The deadline to submit is April 6, 2018. Click here for submission guidelines. We are a new undergraduate journal run by student members of the UBC Asian Canadian and Asian Migrations Studies (ACAM) program. Our hope is to recognize and encourage dialogue concerning Asian and Asian diasporic identities, Asian migrations, and Asian communities both local and global. Undergraduate students from any department and any faculty of UBC Vancouver are welcome to submit. You do not have to identify as “Asian” in order to submit; submissions from all voices are welcome, as long as they adhere to the theme specified. We also encourage submitting coursework that is done/being done and that you want to share with the community (e.g. essays for an Asian diasporic literature course; media projects for a Film Production course; a comic from a Creative Writing course, etc.). For ideas of the kinds of work we are interested, check out the recent ACAM: Articulations showcase recording on the UBC ACAM website. Topics surrounding Asian/Asian diasporic identities, and Asian migrations, and/or Asian/Asian diasporic communities both local and global. Work concerning any and all cultural backgrounds or experiences of Asian(-)Canadian and Asian diasporic identities are welcome. Academic essays, Creative writing (poetry, prose, playscripts), Visual artwork (photography, sketches, drawings, paintings, film, graphica), Community work (interviews on students/faculty/community members, reviews/reports on exhibitions, talks, performances, or other events). You are welcome to submit works that span multiple genres. 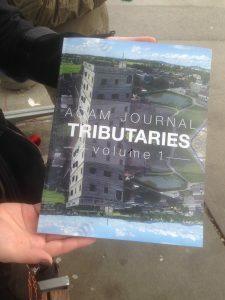 Check us out at acamjournal.wordpress.com!